Ah, the Hollywood Bowl season. The music under the stars. The celebrity soloists. 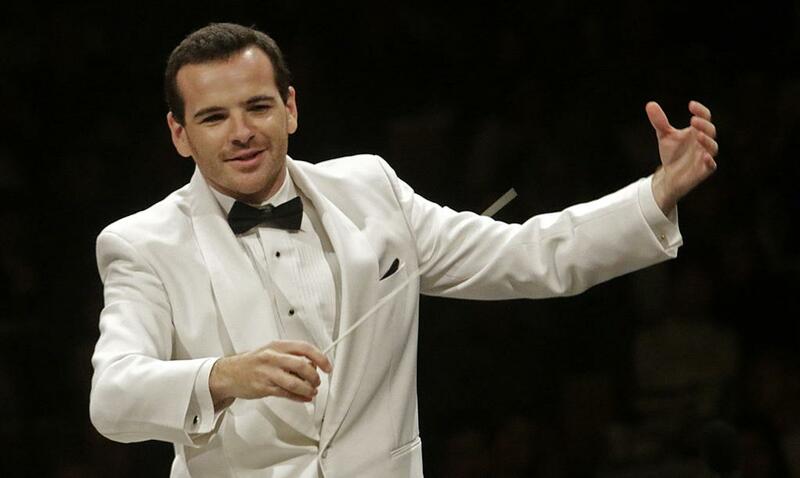 The reliable if relatively unheralded conductors. The people watching. The pre-concert drinking and picnicking. The mid-concert helicopters. The late-concert fireworks. The post-concert crush of many thousands all trying (and largely failing) to quickly amble downhill to their bus or car at the same time. Good times, good times . . .
Last week’s classical music opener at the Bowl was all that and more, a microcosm of what a typical summer holds packaged neatly into one evening. The program included a nice range of music from Russian and French composers, ranging from the de rigueur warhorse (Boléro by Ravel) to a less-familiar work (the Prokofiev’s Piano Concerto No. 2), with more in between. Yuja Wang was the designated “big name” on hand. The 28-year old Chinese pianist has rapidly become Bowl royalty, for both her skill and her style. While Ms. Wang’s fashion choices may not be to everyone’s taste, it’s tough to argue with her work on the keyboard, especially when she plays repertoire in her strike zone (as opposed to, say, Gershwin). Count any of the Prokofiev piano concertos as a fat pitch thrown over the middle of the plate, and on this night, she knocked the 2nd Piano Concerto out of the park. The thorny work is absent the grandeur of Prokofiev’s first concerto, the charm of his third, or the hummable melodies present in either; however, what it does have in spades is a collection of opportunities to show off a pianist’s skills. Ms. Wang did that and more. She gave the four movement work, especially the first and last movements, a sense of structure. In the process, she shaded lines within each movement with an evolving sense of moodiness, dark and uneasy one moment and manic the other, supported admirably throughout by conductor Lionel Bringuier and the orchestra. Her interpretation was both intensely musical and technically stunning. That anyone can move their hands and fingers so quickly in any capacity is astounding; that Ms. Wang can do it so accurately on a keyboard borders on supernatural. I’m guessing many in the 9,999-person audience weren’t familiar with the piece, but after such an impressive performance, they roared and jumped to their feet nonetheless. And if they weren’t already justified in their response, a thoroughly whiz-bang account of Vladimir Horowitz’s famous solo piano variations on a theme of Bizet’s Carmen fixed that. Just when I thought Ms. Wang couldn’t play any faster than she had in the Prokofiev, she proved me wrong. Yowza. Beyond Ms. Wang’s contributions, the concert supplied other excellent moments, chief among them was Mr. Bringuier’s take on La mer. The LA Phil’s former Resident Conductor favored a consistently brisk tempo throughout, taking a few moments here and there to ease off and let things relax before pushing forward once again. It painted the sea as a restless place, with brief bits of stillness and meditation constantly being interrupted by perturbations and distractions small and large. In the Bowl’s expansive sound environment, it was a winning approach. The orchestra played admirably, sounding in mid-summer form. The Russian first-half opened with Borodin’s Polovtsian Dances from Prince Igor. It was a lovely performance, with Mr. Bringuier and the LA Phil breezily making their way through the hum-along tunes with grace. Among the many individual contributions, a tender solo by Principal Clarinet Michele Zukovsky was the most notable. The relentless strains of Ravel’s Boléro wrapped up the official program for the evening. Mr. Bringuier took it at reasonably healthy pace (though nothing close to the sprint that the late Rafael Frühbeck de Burgos ran the last time the orchestra played it at Walt Disney Concert Hall a few years ago). From the first gentle taps on the unyielding snare drum (played with incisiveness by Michael Werner, on loan from the Seattle Symphony) and the introduction of the signature melody by a solo flute (a lovely rendition by Catherine Karoly, the LA Phil’s Associate Principal), the work grew and unwound throughout the panoply of instruments within the orchestra in steady fashion before the inevitable explosion at the end. Among the many solid individual contributions, Ms. Karoly’s flute, James Rotter’s soprano saxophone, and James Miller’s trombone solos were my personal favorite. Explosions of a literal nature followed immediately thereafter. After a curtain call, Mr. Bringuier quickly jumped onto the podium before the applause could die down to lead the orchestra in another Bizet encore, this time the Farandole from the L’Arlésienne Suite No. 2. A fireworks display lit up the space above the Bowl shell without obscuring too much of the music in the process. The Bowl’s amplification was generally on good behavior, though it was as if the sound engineers decided to mic the orchestra much closer than in previous years, giving individual instruments a clearer if more artificial sound at the expense of blend. Playing guest principal horn on this night was Jacek Muzyk, Principal of the Buffalo Philharmonic. I counted seven aircraft (helicopters and planes) buzzing loudly enough that I could hear it over the music. The loudest and most annoying helicopter intrusion? As you’d suspect, it happened during a quiet moment (specifically, at the end of the first movement of the Prokofiev). My wine selection for the first night of this year’s Bowl season: shockingly, I went without. A combination of sushi being the meal of choice and a below-21 CKDH, Jr., being my concert guest led me to the surprising choice. And yes, despite my lack of vino, I still managed to enjoy my Bowl experience. On the subject of Ms. Wang’s wardrobe: the most noteworthy thing about what she chose to wear on this particular evening was not her dress (which looked like it was made after someone shot a disco ball and used its pelt for the fabric) but rather a white plastic/rubber thing that adorned her wrist. I thought maybe it was Fitbit or perhaps some kind of watch; however, after some discussion with my very knowledgable seat mates, we have a strong suspicion that it’s one of those magnetic wristbands that some people wear because they think it improves their blood circulation, relieves pain, or optimizes their chi. Now, I’m not one of those people, and I can’t imagine playing something as taxing as the Prokofiev 2nd while something dangled loosely from my wrists. 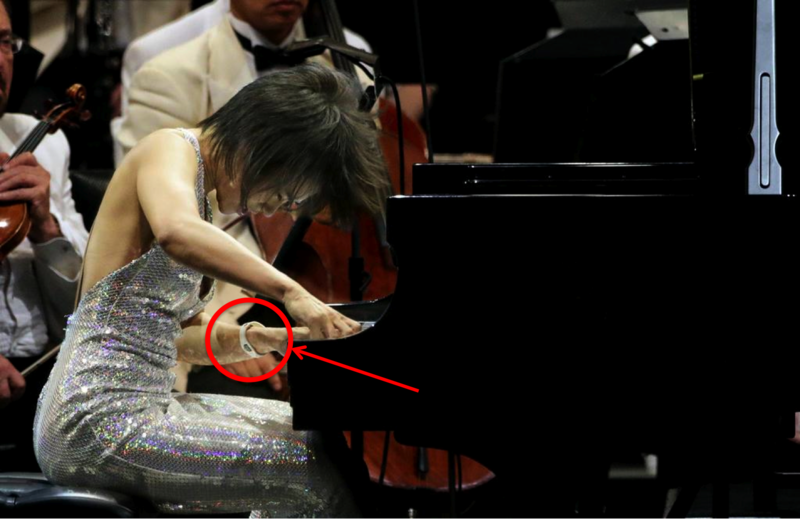 That said, Ms. Wang clearly IS one of those people, and she can play while wearing it. I’m not gonna argue with the results. Tags: Bizet, Borodin, Hollywood Bowl, Horowitz, Lionel Bringuier, Prokofiev, Yuja Wang. Bookmark the permalink. The orchestral encore that “accompanied” the fireworks was of course by Bizet. Yes, of course. A mishap confusing one of those French composers that start with he other.